According to an old story, Bentong was previously known as Kapong. It was changed from Kapong to Bentong before World War I. 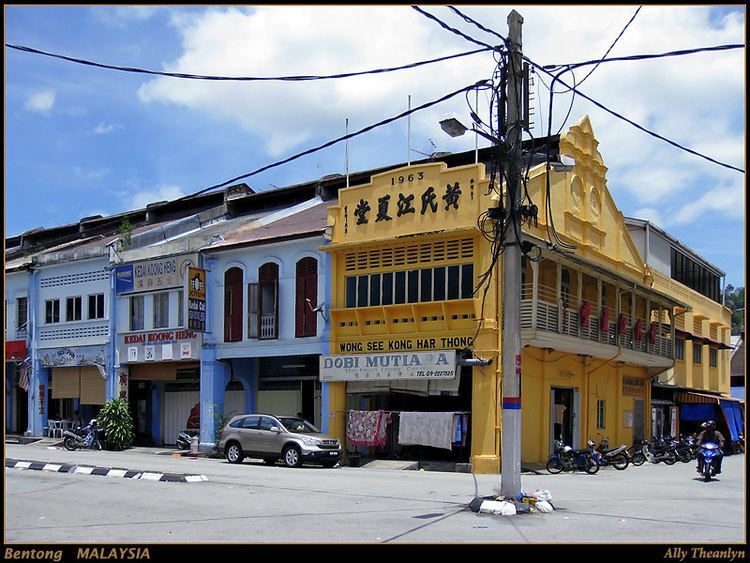 In earlier times, the center of Bentong was around the market area, at the meeting point of the rivers Repas and Perting. The most important transportation way at that time was the rivers by using perahu (small boats). The jetty was situated in front of current rest house (near current Bentong Police Station). Bentong became a focal point when tin ore was discovered in the two main rivers, Repas and Perting. Tin developers constructed ‘ban’ to extract more ore, hence more profits. The practice became a talking matter to the people outside Bentong, who referred to it as the story of ‘ban untung’ (the Profitable Ban). ‘Ban Untung’ became more well-known than Kapong that later people began to call it Ban Untung. From the name ‘Ban Untung’ was what the name for the district of Bentong derived from. From other story, according to Pak Zek (Budayawan Dato’ Haji Zakaria bin Hitam), the name Bentong originated from ‘Bapong’ (meaning float). Bentong was once used as a fort by Dato’ Bahaman. The British army sent over the Gurkhas mercenary to defeat Dato’ Bahaman to take over the area. However, a number of the Gurkhas were killed after they were ambushed by Dato’ Bahaman’s men. Their bodies were thrown into the river and floated in the water. Following the incident, the site was known as Bapong, and later known as Bentong. The exact date of the name change was on 31 August 1957.